​The Olmsted Ensemble (Peter H. Bloom, flute; Brian Clague, violin; Jennifer Shallenberger, viola; Timothy Roberts, cello) concertizes widely, performing masterpieces and rarely-heard treasures by European and American composers. The group takes its inspiration from Frederick Law Olmsted, the great landscape architect and creator of Boston’s Emerald Necklace and New York’s Central Park. His work was visionary and forward-looking, while also honoring and extending traditions of the past. 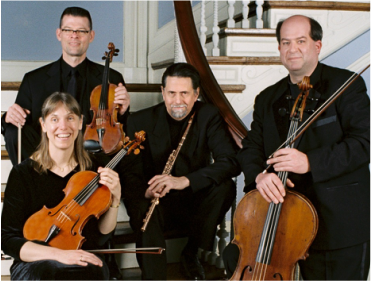 The Olmsted Ensemble is a member of the New England States Touring Roster. 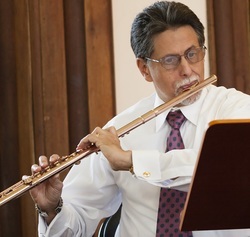 Members of the ensemble have appeared with orchestras and chamber groups in North America, Europe, and the Far East. ​Brian Clague, violin, has toured throughout the U.S., Europe and Japan. In recital, he has appeared as violinist and pianist at the Warsaw Mozart Festival and the White Nights Festival in St. Petersburg. He is active as a recording artist for national Public Broadcasting Service productions at WGBH studios in Boston as well as for film, major record labels, and commercial projects. Jennifer Shallenberger, viola, has performed with chamber ensembles and orchestras in North America, Japan, Taiwan, and Korea. She serves regularly in orchestras including Boston Modern Orchestra Project, National Lyric Opera, Vermont Symphony, Rhode Island Philharmonic, New Hampshire Symphony, Portland (Maine) Symphony, and Indian Hill Symphony Orchestra. As a chamber musician, she is a founding member of the Boston Viola Quartet. Cellist Timothy Roberts has performed nationally and internationally with such distinguished groups as the Boston Symphony Orchestra, Smithsonian Chamber Players, Alea III, the Carmel Bach Festival, the Boston Pops, the New England Ragtime Ensemble under Gunther Schuller, and the Vienna Choir Boys as a member of the Brandenburg Ensemble.